The Red Hat Enterprise Linux installer (known as anaconda) assists in the installation of Red Hat Enterprise Linux 7. This section of the Release Notes provides an overview of the new features implemented in the installer for Red Hat Enterprise Linux 7. 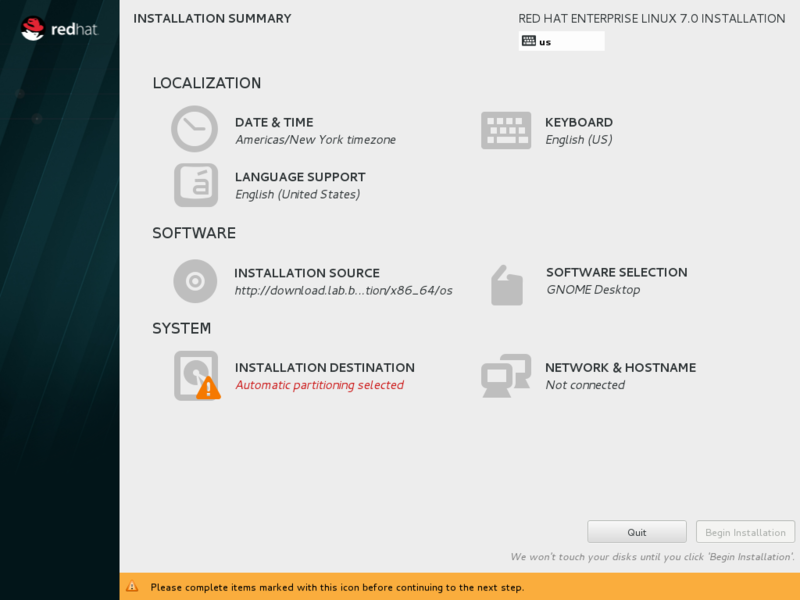 The new installer in Red Hat Enterprise Linux 7 features a wide range of bug fixes and enhancements, including: a fully redesigned graphical installer and major updates to the storage configuration tools. The Red Hat Enterprise Linux graphical installer provides an intuitive graphical user interface to prepare a system for installation. The Red Hat Enterprise Linux 7 graphical installer introduces a brand new user interface designed to make installation quicker and easier. Previously, the installer was a series of wizard-style screens that required the user to review the settings and click to get to the next screen. The new installer interface provides a central hub that lists groups of configuration options for an installation; the user clicks on the options that need changing, changes them, then initiates the installation. The new graphical installer also generates automatic default settings where applicable. For example, if the installer detects a network connection, the user's general location is determined with GeoIP and sane suggestions are made for the default keyboard layout, language and timezone. Additionally, the graphical installer processes some tasks concurrently (for example, storage layout detection) allowing the user to continue configuring the installation using the GUI while the processor-intensive tasks are processed in the background. The text-based installer is provided primarily for systems with limited resources. Red Hat Enterprise Linux 7 features a completely rewritten text-mode installer that provides better support for serial consoles and other limited display interfaces. The text-based installer utilizes the tmux utility, making multiple shell terminals available for all installation methods, not just those supporting Linux virtual consoles. Kickstart is an automated installation method that system administrators can use to install Red Hat Enterprise Linux. Using kickstart, a single file is created, containing the answers to all the questions that would normally be asked during a typical installation. Kickstart in Red Hat Enterprise Linux 7 supports Active Directory host enrollment using the kickstart service realmd. The installer in Red Hat Enterprise Linux 7 supports the development of plug-ins that can provide site-specific extensions or customization. Plug-ins can be developed to add additional screens and options to the graphical installer. The plug-in architecture also allows developers to add new kickstart commands for system administrators to utilize. The Manual Partitioning screen in the graphical installer interface has been completely redesigned. The redesigned screen is different from most other Linux installers in its approach, but allows a full range of capabilities. The available controls allow you to set up complex partitioning layouts using physical partitions (both primary and extended), Logical Volume Management (LVM) layouts, software RAID and Btrfs setups. The interface is documented in the Red Hat Enterprise Linux 7 Installation Guide. The installer does not expose all possible storage tunables in the user interface. In order to accommodate users who require very low-level configuration of their storage, the user can exit the installer to perform their storage configuration. The user can then return to the installer and have it rescan the storage to detect their configuration and present it in the graphical interface. 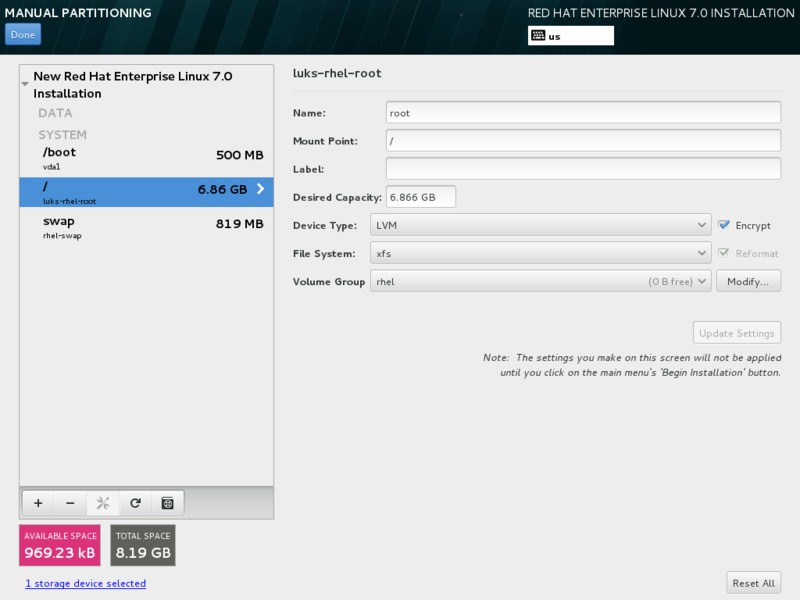 The Red Hat Enterprise Linux 7 installer offers more automatic partitioning choices; for example, LVM, LVM with thin provisioning, BTRFS, or standard partitions. Previously, the installation environment implemented its own initialization and device discovery tools that were different from the tools used to boot the installed system. In Red Hat Enterprise Linux 7, the installer utilizes the same initialization (systemd>) and device discovery tools (dracut) as the installed system. After installation, the initial system configuration screens allow for further configuration of Red Hat Enterprise Linux 7 installation. 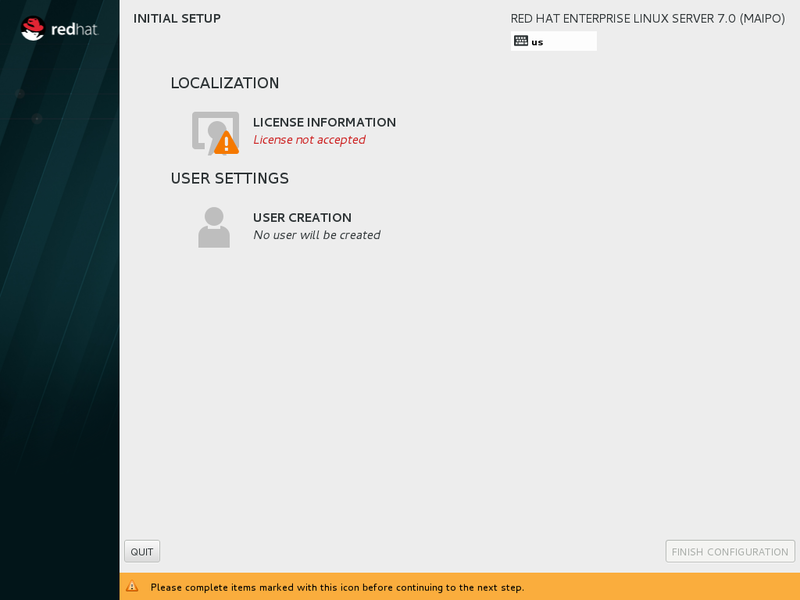 The Initial System Configuration screens in Red Hat Enterprise Linux 7 are also redesigned to match the user experience of the new installer graphical interface. Additionally, some tasks that were traditionally only configurable post-installation (for example, creating the initial user) can now be configured in the installer while the system is being installed.